Paceville, Malta's so-called nightlife hotspot is gaining notoriety. But perhaps not for the right reasons. Is there anyone over 16 here? Love it, hate it, wait eagerly to go there weekends, or wince at the thought of it, all Malta has a reaction to Paceville (pronounced ‘parch-i-ville’). Routinely billed as the heart of Malta’s nightlife, it’s either the place to be seen or a place to avoid, depending largely on your age and taste in night life. It has everything from clubs to gentlemen’s clubs and a casino, and an atmosphere ranging from tacky to cool. The four ‘s’ words are probably what most people of certain ages go looking for or chance across if they aren’t. In these last weeks of peak summer 2011, we reflect on what this season has added to Paceville’s reputation. The past week alone has seen a flurry of news reports ranging from those detailing the latest incidents of violent behaviour on Paceville’s streets to businesses’ calls for a new structure – a ‘Paceville Agency‘ – to deal with the areas’ ills. Somewhat in the minority are other voices complaining Malta is painting too black a picture of its top nightlife area. Not good for tourism, they say. I feel they do have a point there as many businesses in Paceville work hard to run a tight ship. But most of us here in Malta are quite aware there’s a gaping void between glossy brochure speak and the reality of Paceville. The area has enjoyed a meteroic rise to infamy this summer. Though some commentators say it was actually worse 30 years ago. It’s a shame because there are good many excellent restaurants tucked away down its side streets which could attract more business. It has a Blue Flag beach and picturesque bays on its fringes too. But I know a lot of locals who simply won’t go near the area from May to September. 2. to meet the same people over and over again. No interesting conversations take place there.. just useless, drunken chat. 4. because ‘there is nothing better to do’. 5. the weekend shows up and people simply feel like clubbing. There are still many who love the place because of that. (Afterthought): It’s still very cheap to go out (especially if you’re a girl). There are no entrance fees to many of the clubs. It’s drawing ever younger people in: 14 year-olds go there supposedly accompanying their elder siblings.. and end up getting wasted themselves. By the time you get to 21, you’ve done it all and want to move on. Also, if you’ve done any serious travel yourself, you know that there is life beyond Paceville. Verdict? Go there understanding what Paceville is, and you won’t be disappointed. What and where is Paceville? It’s a compact, urban peninsula between St George’s Bay and Spinola Bay and facing the inland residential area of Swieqi. It also has a large number of five-star hotels on its fringes. The St George’s Bay (newly-made) beach is considered Paceville’s local beach. 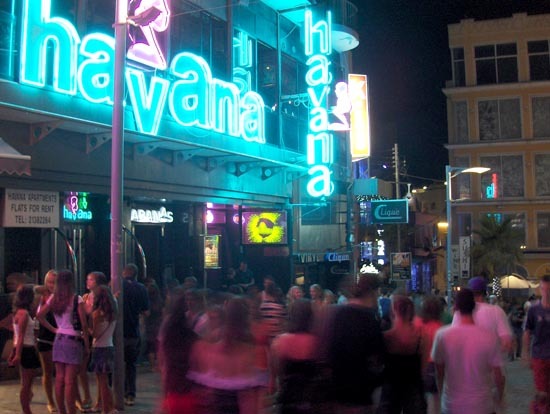 Paceville life centres on Dragonara Road, Wilga Street, St. Georges Road and St. Rita Steps where clubs, bars, restaurants, snack outlets, discos and more spill out into paved streets. It isn’t that attractive a place by day, but at night, it’s like Malta’s mini version of London’s Soho, Leicester Square and Piccadilly Circus – loud, brash and in your face. Facilities: police are present and increasing in numbers; taxi ranks in main square; Wembley’s, a well-known taxi & mini-bus firm, is just five minutes walk from central Paceville. Minibus services to most outlying towns and villages operate till the early hours. Taxi sharing also possible. Arriva runs a lot of night buses from St Julian’s. Click here for the list of routes and times. There’s some park and ride services too, which make life a bit easier if you’re driving. Photo: Courtesy of Spacing Magazine. Next Post Comino as you’ve never seen it before! Yes, you are right, there are more sophisticated adult offerings springing up in Paceville, but this article here was a teen’s take on things and in peak summer months, there is an awful lot of truth in the vibe they talk of. I’d love an adult, lounge-view of the area, to counter this teen low-down, so if you’re up to it, would you like to expand a bit more on your comment and give us more on the ‘adult view’? I would imagine that many adults tend to head to Paceville in shoulder and off-season months, as I do, to avoid the chaos of summer and heaving teen crowds. Certainly this summer there were two or so news items from bodies representing businesses in Paceville calling for more police etc in the area, among other measures. Of course, others said that would be counter productive as it would signal that the area was becoming a ‘no-go’ zone, which as you say, it’s clearly not! There are issues to resolve, and the developments might change the atmos – we hope. “Charlie”‘s comments certainly do not paint an accurate picture of Paceville. In the past decade the mini-Ibiza has changed drastically – although the tacky, cheaply-designed boom-boom-boom places packed with kids still exist, Paceville has become substantially more “adult”, mature, and upmarket in recent years. There are today a huge number of excellent hotels in the area: The George, Vivaldi, Dragonara, Hilton, Intercontinental, and Valentina, just to name a few. There are also loads of great restaurants: Avenue, Estilo 24/7, Chicago, and many others. There’s an increasing number of lounge-clubs such as Hugo’s, Bar Celona, and most recently, Empire. Many of the older bars have also been refurbished and modernized (Black Bull, Peppermint). The Axis shopping centre (replacing the old club) and the Pendergardens development are also set to continue this transition of Paceville from the tacky hangout place for drunken teenagers, to an upmarket chic nightcluf hub for both teenagers AND (mostly) the 20 and 30-something adults crowd.